In the soul, T. Colin Campbell is still a small farmer in northern Virginia. When we spend time together, we inevitably tell our stories farm. Whether the épan- dage manure, tractor driving or cattle drives, we have both a lot to share regarding the work on the farm. But we both left the farm at any given time to embrace another career. And it is for his achievements in his other career I admire Colin. He discovered a chemical called dioxin and later he led one of the largest ever undertaken studies on the relationship between diet and health study in China. Meanwhile, he has written hundreds of scientific articles, he has served on numerous committees of experts governmental and he helped form national and international organizations on health and diet, such as the Global Fund research against cancer and the American Institute of research against cancer. As a scientist, he played a key role in how our country develops the link between diet and health. By learning about Colin on a personal level, I have come to respect for reasons other than business or for his courage and integrity. last after she publicly declared not want to eat meat. I went to Washington, DC, to exert pressure so that agricultural practices improve and change the way we raise livestock and grow crops. I assumed the management of the most influential pressure groups and better subsidies tioned country and I can tell you it is not easy. As Colin and I have similar course, I feel in connivance with his story. We started at the farm, we learned to be independent, honest and have integrity in small communities, to then establish ourselves in more traditional professions. After both successful (I still remember the first check to seven figures I signed for my big cattle operation in Montana), we came to realize that the system in which we live could be improved. To challenge a system that gives us such returns demanded an iron will and unwavering integrity. And Colin both. This book is the culmination of a long and worthy career. Although we would learn from Colin, who reached the pinnacle of his profession and had the courage to go further in trying some things change. Whether you're interested in your health or the health of the United States, this book will be a blessing for you. Read it carefully, absorb the information it contains and apply them in your life. you can eat all you want, without having to exercise and lose weight. It is easier to find a chocolate bar, a Big Mac and a Coke than finding an apple. And your children eat in school canteens where design is limited to vegetables ketchup in hamburgers. You will see the doctor to give you some tips to stay healthy. However, in the waiting room, you find a glossy cover in magazine 243 pages entitled Family Doctor: Your Essential Guide to Health and Well-being. Published by the American Academy of Family Physicians and sent free of charge to 50,000 US physicians in 2004, this guide contains whole pages of McDonald's advertising, Dr. Pepper, cho- COLAT pudding and Oreo cookies. You pick a number of National Geographic Kids, a magazine published by the National Geographic for children six and over, until you find good reading for them. But the pages are filled with ads for Twinkies, M & M, Frosted Flakes, Froot Loops, Hostess Cup Cakes and Xtreme Jello Pudding Sticks. This is what scientists and food activists at Yale University called a toxic food environment, environment in which most of us live. We are faced with an inescapable fact: a number of people earn a lot of money these days by selling unhealthy foods. They wish that you continue to eat the foods they produce, even if they make you fat, you remove all vitality, and degrade shorten your life. These people want you docile, submissive and ignorant. They do not want you informed, active and full of life, and they are willing to spend billions of dollars every year to achieve their goals. You can track the current and succumb to junk food vendors, junk food, or establish a healthier and more vital relationship between your body and your diet. If you want to live healthy, slim and full of vitality, you need a hand in our current society. Fortunately, you hold in your hands the book that you nera Don- this helping hand. Dr. T. Colin Campbell is well known as a brilliant scholar, researcher and devoted great humanitarian. As I have the pleasure and the privilege of being his friend, I can only confirm this. But I can also add something else. Colin is a man of great depth and great humility, a man whose steps are guided by his love for his neighbor. This new book by Colin Campbell Report, is a ray of light in the darkness of our times. He so clearly and completely light on the relationship between diet and health that you can not remain prey to profiteers who misinform you and make you confused and subject that you may eat the foods that they sell. are to me just great, but it shows you always how he came to his conclusions. Data and truth are what matter to him. His only goal is to help you live as informed and healthy as possible. I have read this book twice, and each time, I learned a lot. This is a wise and courageous book. The Campbell Report is incroya- ably useful, beautifully written and deeply important. The labor Colin Campbell is revolutionary in its implications and spectacular in its clarity. If you want to eat bacon and eggs for breakfast and then take drugs to lower your cholesterol, you are free to. 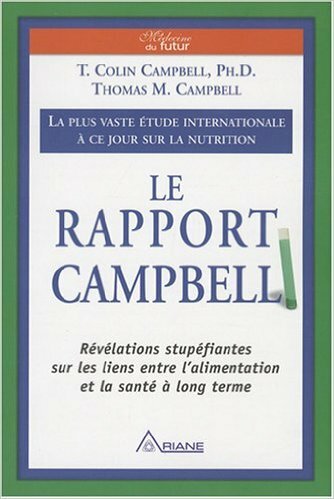 But if you really want to take control of your health, read The Campbell report without waiting! If you follow the advice in this remarkable guide, your body will thank you for the rest of your life. - John Robbins, author of Diet for a New America, Reclaiming Our Health, and Food Revolution. The public wants to know the role of food in terms of health, and this thirst for information never ceases to amaze me even though I have devoted my professional life to conduct experimental research in this area. The books on diets are immutable seller. Most Popular magazines are providing nutritional advice, newspapers regularly devote articles, and television and radio programs on offer constantly dieting and health. Despite this deluge of information, are you sure you know what you have to do to improve your health? Should you buy foods labeled organic to avoid ingesting pesticides? Are present in the environment chemicals the major causes of cancer? Or is she your health determined by genes inherited from your parents? Carbohydrates are they you really fat? Should you care more about the amount of fat you eat, or just saturated fats or trans fats? What vitamins to take, if any? Buy yourself the nourri- enriched fiber ture? Should you eat fish? And if so, how often? Consumption of soy products it prevents heart disease? I guess you're not really sure of the answers for these questions. If this is the case, you're not alone. Although information and opinions abound, very few people really know what they should do to improve their health. Not that research has neglected this field, as it has studied. We have a huge amount of information on the influence of diet on health. But good science has been buried under an avalanche of unreliable information or even harmful in the form of pseudoscience of fad diets and industrial propaganda. I want to change this and create a new framework that gives you a better understanding of the relationship between diet and health, a framework that dispels confusion, prevents and treats disease and allows you to have a life more satisfactory. I am one of the highest levels of the "system" for almost fifty years, designing and directing large research projects, deciding which project will be funded and what data will be included in national reports of expert committees. • Also problematic are that synthetic chemicals present in your environment and your food, they are not the main cause of cancer. • The genes inherited from your parents are not the main factors that will determine whether you will be a victim of the ten most important causes of death. • Although genetic research suggests that it could find drugs to cure diseases, one should not underestimate the simple but very effective solutions available today. • Lecontrôleobsessionneldechaquealimentquevousingérez, telsles carbohydrates, fat, cholesterol or fats rich in omega-3 does not have a long term positive impact on your health. • Vitamins and food supplements will not protect your long-term organization. • Drugs and surgery do not cure diseases that kill most Americans. • Your doctor probably does not know what you need to have the best possible health. In this book, I offer nothing less than redefine what we mean by a "good diet". The determining results of my four decades of biomedical research, including the discovery of twenty-seven years of laboratory work (funded by the most reputable organizations) prove that eating well can save your life. I will not ask you to believe conclusions based on my personal observations as some popular authors. There are over 750 references in this book, the majority of information from original tions published in hundreds of journals. They are the result of the work of researchers who paved the way for cancer prevention, the reduction of heart disease, strokes, obesity, diabetes, immune system diseases, osteoporosis , Alzheimer's disease, kidney stones and lacécité. • Unchangementd'habitudesalimentairespeutpermettreauxpatients diabetics without their medication. • Heart disease is potentially reversible just by following a suitable diet. • Lecancerduseinestliéauxtauxd'hormonesfémininesdanslesang are they determined by diet. • Consumption of dairy products is likely to increase the risk of cancer of the prostate. • Antioxidants, found in fruits and vegetables, result in better mental performance in the elderly persons. account of poor child nutrition. These findings confirm that a good diet is our most powerful weapon against diseases and illnesses. Understanding the scientific evidence is not only useful in protecting our health; it also has important implications for our entire society. We need to know why the erroneous information raining down on our society and why we are so grossly deceived as to the influence of diet on disease. We need to know how to fortify our health and how to treat the dysfunctions in our body. A number of measures taken by the US healthcare system prove a failure. In the US, we spend much more on health care per capita than most other countries of the world, which does not prevent the two-thirds of Americans have still overweight. Over 15 million Americans have diabetes, a number that is rapid increase. Cardiovascular disease is also prevalent than it was thirty years old, and the "war against cancer" that began in the 1970s is a fiasco. Half of Americans suffering from a health problem requiring the weekly taking prescription drugs, and more than 100 million Americans have high cholesterol levels. To aggravate the situation further, we help train our young people on the slope of the disease earlier and earlier in their lives. A third of young people in this country are overweight or at risk of having one. Young people develop more and more frequently a form of diabetes that previously affected only adults, and they take more medication than ever. All these problems boil down to three things: breakfast, luncheon and dinner dinner. Early in my career, there are more than forty years, I should never have suspected me that food such consequences on health. For years, I have never concerned me to know what was the healthiest food. I just ate what everyone ate and what I had been told it was good to eat. In general, we eat whatever is tasty and convenient, or what our parents advise us to eat. Most of us live in a culture that defines their preferences and eating habits. This was my case. I was raised on a dairy farm where milk was the epicenter of our existence. At school, we were taught that the cow strengthened us and strengthened our bones and teeth. It was the best food given by nature. At our farm, we produced most of our food, whether in the garden or in the pastures. I was the first in my family to pursue higher education. I did some preliminary studies of Veterinary Medicine at the Pennsylvania State University (Penn State) and, for a year, I attended the Veterinary School of the Georgia State University. That was when Cornell University offered me a scholarship for my research license on feed. I accepted this change, in part because the university would pay me to study. This is where I did my master. I was the last student of Professor Clive McCay, reputed to prolong life in rats by giving them less food than they normally consume. Also at Cornell, I have dedicated my dissertation to find the best ways to grow faster cows and sheep. My role was to improve our ability to produce animal protein, the cornerstone of what we were told was the 'healthy food'. I was started on a path that extolled the beneficial health effects of the consumption of meat, milk and eggs in large quantities. I perpétuais obviously my lifestyle on the farm and I was hours ous to believe that the American diet was the best in the world. During these formative years, I invariably arrived at the same conclusion: apparently the food we ate was healthy, especially those containing large amounts of animal proteins of good quality. Early in my career, I spent most of my time work- vailler with two of the most toxic chemicals ever overdrafts, dioxin and aflatoxin. Initially, I worked for the Massachusetts Institute of Technology (MIT), where they had asked me to solve the riddle of a chicken feed problem. Millions of chickens were dying each year after drinking a toxic chemical produced this stranger in their food. My responsibility was to isolate and determine the composition of the chemical. Two and half years later, I took part in the discovery of dioxin, undoubtedly the most toxic chemical ever discovered. Since this chemical has attracted considerable attention on him, especially because he was an ingredient of the herbicide 2,4,5-T, or Agent Orange, and had been used to defoliate forests of pen - ing the war in Vietnam. After leaving MIT and accepted a teaching position at Virginia Tech University, I started in coordinating a national pro- jet technical assistance to the Philippines, which was designed for children suffering from malnutrition. Part of the project was devoted to an investigation of the unusually high occurrence of liver cancer among Filipino children, whereas this disease usually strikes adults. At first it was thought that high consumption of aflatoxin, a mold toxin present in peanuts and corn, was re- sponsible for this problem. Aflatoxin has been designated as one of the most potent carcinogens ever discovered. For ten years, our main goal in the Philippines was to reduce child malnutrition among the poor, a project funded by the US Agency for International Development (US Agency for International Development, or USAID). Finally, we implemented throughout the country about 110 "self-help groups of en-", specifically in education centers focusing on nutrition. The purpose of these efforts was simple: to ensure that children receive the best possible proteins. It was common to blame the problems of child malnutrition in the world to a lack of protein, particularly in animal proteins. Throughout the world, universities and governments seeking to find solutions to fill what we stood for a protein deficiency in developing countries. However, this project brought me to discover a dark secret. Children with a high protein diet were in fact most at risk from liver cancer! And children were among the wealthiest families. groups of rats. They were administered aflatoxin carcinogenic to one of two groups of rats they were then subjected to a diet composed of 20% protein, amount customarily consumed by many people in Western countries. They then administered the same amount of aflatoxin in the second group of rats and had then submitted them to a diet containing only 5% protein. The results were amazing: each animal consumed 20% protein found himself with liver cancer, so that each animal has been subjected to a diet containing only 5% protein was spared by the disease. This result 100-0 left no room for doubt: foods protect carcinogenic content in chemicals, even those with very high content of carci- nogènes substances. This information was contrary to everything I had been taught before. This was already a heresy to say that proteins were unhealthy. Say they caused cancer was a heretic total sie. This moment was decisive for my career. Conduct research on such a thorny subject at the beginning of my professional life was not a very wise choice. The fact to doubt ments protein and animal food in general made me run the risk of being accused of heresy, even if my conclusions were from good science. But I'm not one to follow trends of thought for the sake of following them. When young, I learned to drive a horse miti- lage, to lead a herd of cows, or to hunt, fish in our river or to work in the fields, I realized I take my own decisions was part of the job. When problems arose in the field, although I was forced to find there a single solution. It was a good school, as every farmer child could tell you. I kept this sense of autonomy until today. the interpretation of our findings. I chose to do this research at a very fundamental scientific level, either by studying the biochemical details of cancer formation. It was important to understand not only if the proteins could promote the development of cancer, but also how. It was the best thing to do. Following a rigorous scientific approach, I was able to study a difficult subject without causing chain reactions that would have triggered radical ideas. Ultimately, and for twenty-seven years, this research was generously funded by organizations with the most renowned and competitive, particularly by the National Institute of Health and Medical Research (National Institutes of Health NIH), the American Cancer Society (American Cancer Society ACS) and the American Institute of Cancer Research (American Institute for Cancer Research AICS). Our results were revised (again) before being published in a number of serious scientific journals. What we discovered was astounding: diets low in protein prevented the onset of cancer caused by aflatoxin, regardless of the amount of that carcinogen absorbed by animals. Even after the onset of cancer, a low-protein diet significantly blocked the development of the disease. In other words, the carcinogenic effects of this chemical were rendered insignificant by a low-protein diet. In fact, evidence of the toxicity of dietary protein was so obvious that we could at will cause or stop the progression of cancer by simply changing the amount of protein in food. More preferably, the amount of absorbed proteins was identical to that customarily consumed by humans. So we do not use massive doses, contrary to what most studies on carcinogens. absorbed in massive doses? Proteins from plants, including cereals such as wheat and soybeans. These findings did shatter some of my most cherished assumptions. But experiments with animals do not stop there. I invested in the most extensive research ever on diet, lifestyle and disease. In the history of biomedical research, this large study was the largest ever conducted with humans. It was jointly conducted by Cornell University, Oxford University and the Chinese Academy of Preventive Medicine. The New York Times named this research "Grand Prize of epidemiology." This study was addressing a large number of diseases attributable to food and lifestyle in rural areas in China and more recently in Taiwan. Better known as the "China Study *" in the English-speaking world, this study allowed to establish statistically significant associations 8000 highlighting the report tions between dietary factors and their impact on health. What made this remarkable study was that many of the research on the importance of links between diet and disease were pointing in the same direction: people who ate a very large amount of food of animal origin were also those that suffered most chronic diseases. Even a minimal amount of animal foods was associated with adverse effects. People who ingest a large amount of vegetable origin foods were healthier and less threatened by a chronic illness. These findings could not be ignored. The results of experiments on animals with male animal proteins and the findings of the major study on the eating habits of humans absolutely consistent. Consuming foods of animal origin or plant origin had completely different effects on health. * Throughout this book, whenever it is mentioned in this study, as we discuss in the study in China. among the most exciting carried out over the last fifty years. The findings, described in Part II of this book, show that heart disease, diabetes and obesity can be resolved through an appropriate diet. Other studies highlight the undeniable influence of diet on the development of different forms of cancer and autoimmune diseases, bone health, kidney and on the problems of sight and memory arise in old age (cognitive dysfunction and Alzheimer's disease).